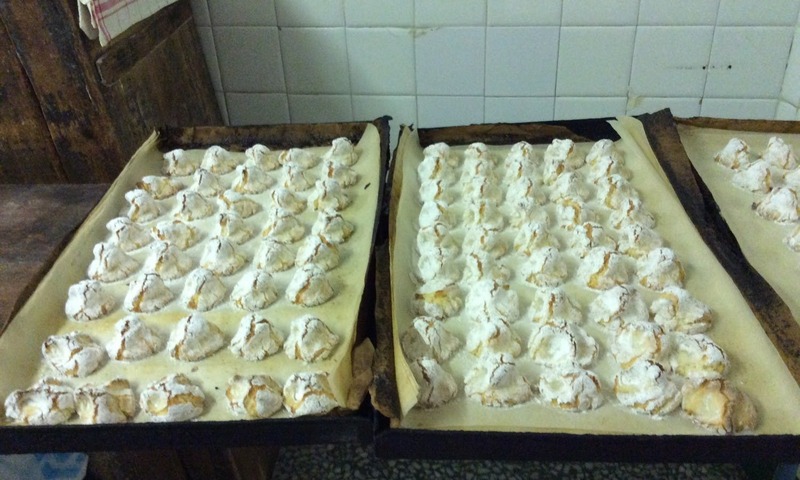 Piedmont is filled with many gastronomic wonders, among which amaretti cookies rank high. Here, one Musement staffer takes an up close look at how to make these popular Italian Christmas cookies. Thanks to Musement, citizens of the world have thousands of international activities at their fingertips—literally—when travel planning, and one of the perks of working here is having the opportunity to participate in local activities, particularly the food and wine ones. Our Milan headquarters place us in the heart of Lombardy, which neighbors majestic Piedmont, arguably Italy’s best food and wine region (though the Emiliani and Romagonoli might beg to differ). Regardless of where you stand on the matter, there’s no denying that Piedmont is replete with gourmet treasures, one of which comes in the form of amaretti cookies. 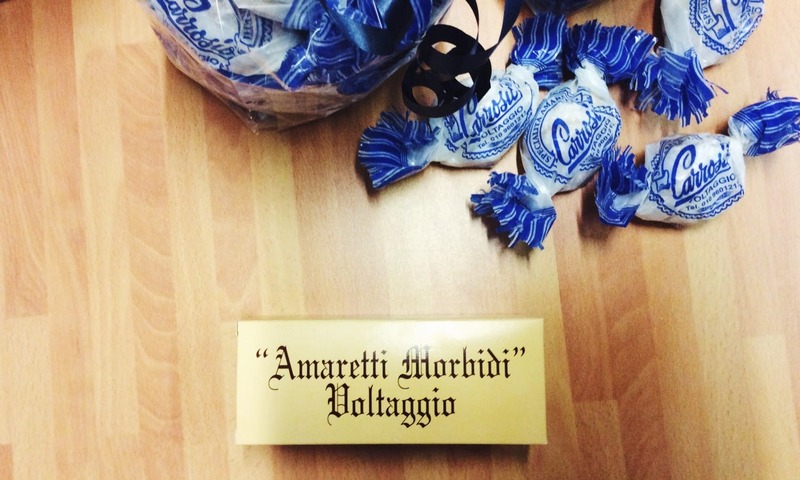 Holding the title of one of Italy’s most beloved cookies is both a blessing (for obvious reasons) and a curse, as the prestige renders the confection ripe for mass production, which can really kill its integrity. As someone who appreciates anything with a story behind it, Panificio Carrosio Luca, located in the tiny Piemontese hilltop town of Voltaggio near Gavi, blew me away. 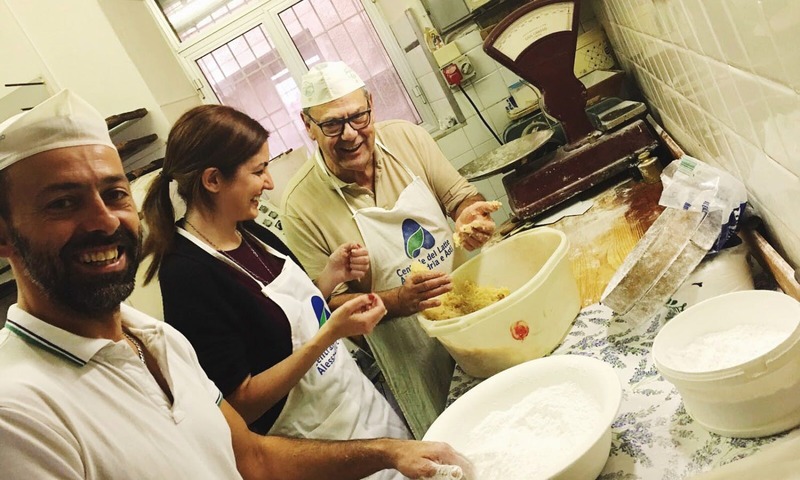 The heartwarming, kind and lovable Carrosio family has been making amaretti morbidi in their cozy bakery since 1899 and today, the fourth generation run the show: brother and sister Luca and Giovanna, with some assistance from their father Gian. The fifth-generation, Luca’s four-year-old son Nicola, has already started to hone his amaretti making talent, and he has a personalized apron to prove it. The family has amaretti making down to an art and of all their handmade delicious delights, their amaretti really put them on the map—and not just in Italy, as they have shipped the fruit of the labor to customers all over the globe, from New York to Russia to Japan. So, the amaretti recipe essentials are pretty basic: a mix of bitter and sweet almonds from Bari; egg whites; sugar and a sliver of a vanilla bean. The almonds are chopped by a mixer outfitted with a special granite stone that doesn’t absorb the almond oil, which retaining is key to the amaretti’s smooth, soft melt-in-your-mouth texture. The ingredients are combined and mixed, the cookies shaped and then placed on a baking tray and topped with a dusting of gluten-free powdered sugar. Luca places them on the oven’s slanted bottom level for 15 minutes at 200 degrees taking care to keep the oven door open, otherwise, it’s too humid inside which kills the amaretti. 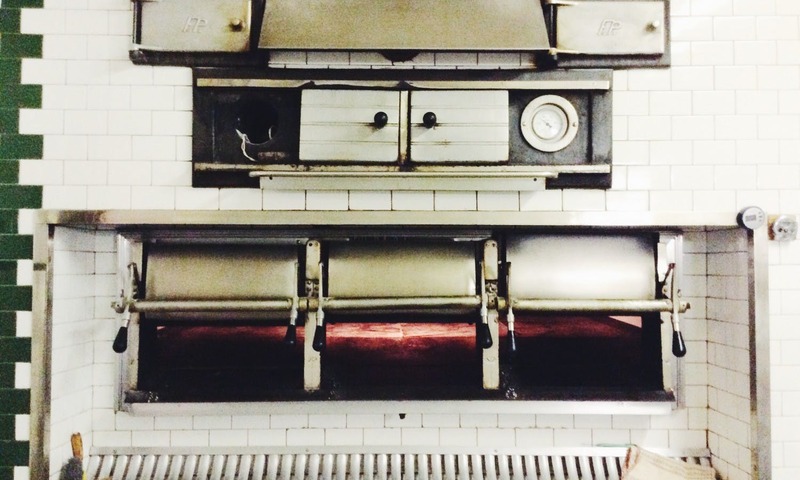 The massive oven dates back to 1959 and has two slots, the narrower top level is used mostly for bread, in particular, the pane col crescente made from a 90-year-old lievito madre. Sounds easy enough, no? Well, watch them in action. On paper, the recipe seems as easy as pie, but a complexity underscores its simplicity. Gian and Luca’s assembly line system moves at the speed of light and I stood there in my apron with my mouth agape thinking there was no way in hell I would be able to do that. 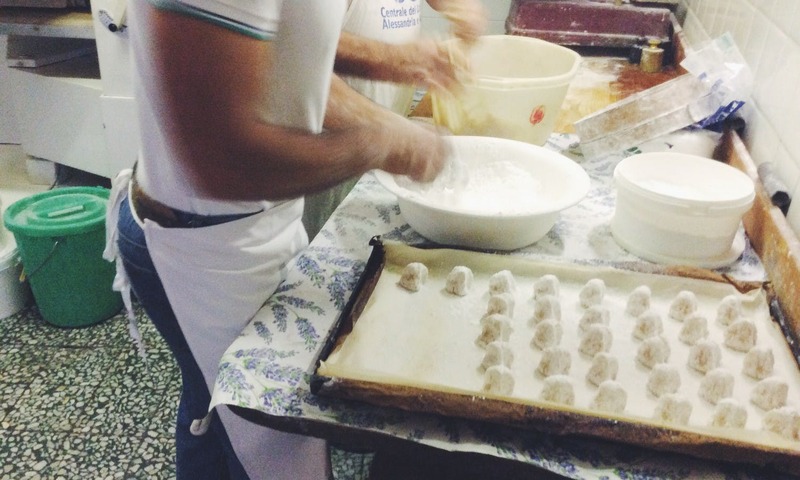 Gian straightens his right hand, scoops out some amaretti dough, which then sits on his hand between his thumb and forefinger. He uses his other thumb and forefinger to scoop the dough onto the same place of his other hand and repeats the motion one last time bringing a dollop of dough back to its starting point. Then, he flicks it perfectly into the bowl of powdered sugar where Luca gives it a couple of spins to make sure it’s covered, picks it up with three fingers (thumb, forefinger and middle) and places it straight down on the tray, making three perfect dents on top. They fill up the tray in what seems like less than 60 seconds, while it takes me least 60 seconds to do one! Oh, how I struggled…but oh, what fun it was! The first time I tried to flick the dough à la Gian, it turned upside down and wouldn’t budge from my fingers. Also, all of my cookie shaping attempts were a bit nightmarish. Mine didn’t look nearly as divine as Luca’s. At first, I secretly blamed my abysmal fine motor skills, but then Luca indicated that my fingers are “troppo lunghe” (too long) and “troppo sottili” (too skinny”) to properly shape the cookies, so I’m going to go with his expert diagnosis and blame my God-given finger shape. The amaretti, whose name means little bitters, emerged from the oven (the ones made by my hands stuck out like sore thumbs), cooled and dug in. Perfectly crispy on the outside and dreamily chewy on the inside, the cookies had just the tiniest trace of bitterness (hence their name) to balance the sweetness. I have lived in Italy for almost four years, and this was one of the most memorable, heart-warming experiences I have had here. Make amaretti with the Carrosio family for an unforgettable afternoon. Book your amaretti making class in Voltaggio here. 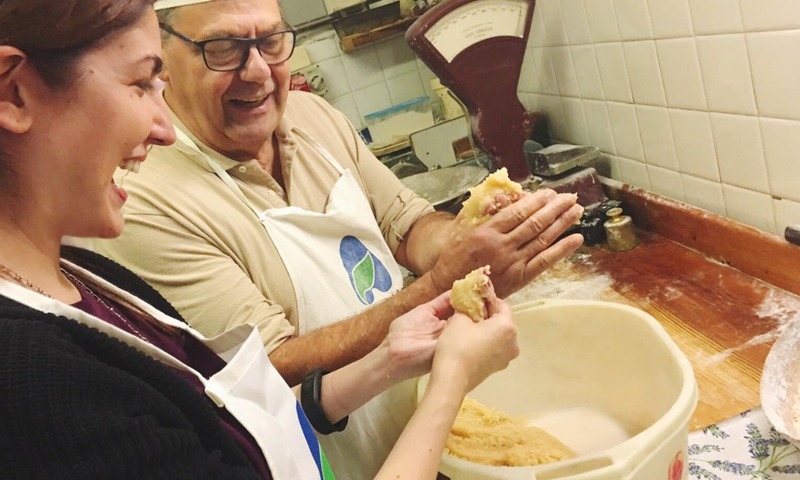 Jaclyn DeGiorgio is a Milan-based storyteller and food tour guide. She logs her adventures in Milan and beyond on her blog A Signorina in Milan, and has also written for Conde Nast Traveler, The Financial Times, Fathom, Food Republic, 1820 Magazine and Liquor.com.